Edward Freniere and a partner founded Lambda Research Corporation in 1992 with the idea of developing software to simulate the behavior of light, basing their first product on public-domain stray light analysis software created by Honeywell. “We had an educated hunch there were other applications for this kind of software,” he says. Little did they realize just how many other uses such a program might find. Indeed, predicting and eliminating stray light was what NASA’s Jet Propulsion Laboratory (JPL) had in mind when it granted the Littleton, Massachusetts-based company a Small Business Innovation Research (SBIR) contract the following year to develop a new, more user-friendly program. The Agency needed an efficient way to see how light from objects outside its imagers’ field of view would affect the pictures they produced, because this stray light can overpower dimmer objects that might be the camera’s true target. But it was and still is, just as it also is useful in the defense, medical, consumer electronics, solar energy, and light pipe industries. Tolis Deslis, who has since left NASA, was an optical engineer at JPL when Phase I and II SBIR contracts were granted to Lambda to develop the software. At the time, he was designing the lenses for the Earth-observing Terra satellite’s Multi-Angle Imaging Spectroradiometer (MISR), which became the first imager devised with the help of TracePro. One of the many medical uses for TracePro is validating designs for blood oximeter pulse monitors. 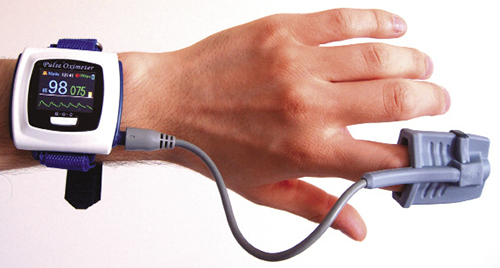 The monitors measure oxygen in the blood by observing how light travels through the fingertip. There was a program available for modeling ray behavior, but it was expensive, difficult to use, and incompatible with both Windows and the existing computer-aided design (CAD) software used to design the instruments, he says. The user had to recreate the entire geometry of the instrument that was to be analyzed, instead of just importing it from a CAD program. Using the first software package Lambda delivered to NASA, Deslis and his colleagues were able to easily analyze designs for the Terra MISR and found that the aluminum lens housing initially planned would admit too much stray light into the system. They opted instead to coat the inside of the lens housing with a compound that would absorb incoming light. “We found this was going to be acceptable in terms of what scientists wanted in signal-to-noise ratio,” Deslis says, adding that the software successfully predicted how light would behave in the imager. The ability to accurately recreate the reflective properties of different surfaces, materials, and textures was as important as being able to predict how much stray light would enter a system and where, he says. Terra, launched in 1999, is still circling the globe and remains the flagship of NASA’s Earth Observing System. Numerous other NASA imagers have since been designed with the help of TracePro. Before the end of the Phase II SBIR contract, the company had already released the first commercial edition of TracePro and taken on two more engineers. TracePro can be used to optimize solar collectors like those pictured here, helping to determine where they should be located and how they should be angled. In 1995, Goddard Space Flight Center awarded the company another SBIR contract to develop software for end-to-end modeling and evaluation of electro-optical systems. Freniere says market analysis didn’t warrant commercialization of that product, but aspects of it, such as calculation of diffracted light, were incorporated into later versions of TracePro. A major key to the software’s success was its compatibility with CAD programs, such as AutoCAD and SolidWorks, he says. To accomplish this, the company licensed the geometry engine at the heart of these modeling programs and built its software around it. “We were the first ones to do that, and it really helped us succeed,” Freniere says. This is what allows the user to import any three-dimensional model from a CAD program, rather than having to build the model in TracePro. Automakers use TracePro to model dashboard displays. 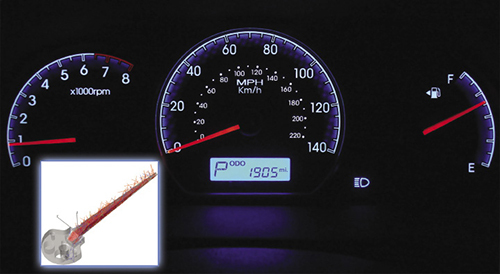 In the inset, the program predicts the behavior of light rays through a computer-aided design of a speedometer needle. TracePro’s largest market is in optimizing overhead lighting designs, from street lamps to offices and retail spaces. The program is used to create virtual prototypes of lenses that can be snapped over a given light-emitting diode (LED) configuration to ensure that it will distribute light in the precise output the designer wants, Gauvin says. Another popular application is the design of light pipes for electronics. These plastic tubes carry light from LEDs on a circuit board to indicators on the device’s exterior, which might show that the machine is on or make a button easy to locate. These often use a complex geometry to guide the light along their length. “Our optimizer helps you create the shape of that light pipe to create the output desired by the illumination engineer,” Gauvin says. 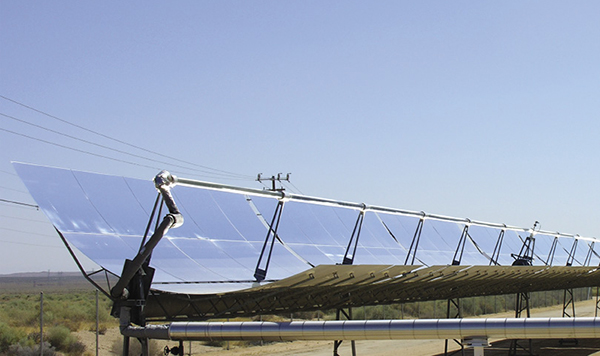 Engineers designing solar collectors, which use mirrors to focus sunlight to be turned into electricity, can also use TracePro to determine where mirrors should be located and how they should be angled and bent to maximize their solar output. A feature in the program uses nationwide sunlight exposure data to predict solar radiation levels, taking atmospheric turbidity into account, at any location for any given time of year at specified intervals. “We have written many, many utilities specifically for these different markets,” Gauvin says. In the medical and life-science industries, light can be used for a range of noninvasive health-monitoring applications. One example is the common oximeter that fits over the fingertip and monitors pulse by observing the scatter of red and infrared light in tissue to calculate the blood-oxygen levels that peak with each heartbeat. Other applications include cell imaging, tissue characterization, molecular spectroscopy, microscopy, and monitoring blood-sugar levels. In all these devices, TracePro helps engineers make decisions about the best wavelengths of light to use, what angle the light should take, where sensors should be placed, and how stray light can be reduced to get the best signal. “We have a 3D viewer that allows you to slice up light propagation through tissue to visualize and calculate absorbed, lost, incident, and exiting energy,” Gauvin adds, noting that this is equivalent to observing a slice of tissue under a microscope. TracePro can also be used to help design laser and LED surgical devices. Carmakers use the software to create virtual prototypes of dashboard displays, which are rendered in photorealistic detail. In recent years, the company has added the capability to view these simulations from multiple angles, for example to show what a display will look like from both the driver’s and passenger’s points of view. It’s an approach that saves companies money by letting them observe and optimize a system before producing it, Gauvin says. In other applications, the program can help designers create everything from signs and lamps to cameras and telescopes. The defense industry has used it for stray light analysis for its imagers, as well as optics for missile systems. Originally created to predict and eliminate stray light in the Jet Propulsion Lab’s (JPL) imagers, TracePro has found dozens of applications across a multitude of industries. In the lower left image, the program predicts the behavior of light rays running through a link rod. In the upper middle image, JPL has reapplied the software to its original purpose: TracePro helped engineers predict and eliminate stray light from cameras on the Spirit and Opportunity Mars rovers, as well as to predict camera performance. In the right-hand image, the program predicts light output from a car headlight. Skelton is using the program to confirm Ball Aerospace’s stray-light analyses of the James Webb Space Telescope, which is set to launch in 2018. He and Ball are now getting results within 20 percent of each other, “which is very good for stray light analysis—I never dreamed we’d get that close,” he says, noting that for a more casual analysis he would be content with agreement within a factor of two. He’s also using TracePro to predict light “noise,” for example from clouds, for the receiver on the Global Ecosystem Dynamics Investigation Lidar, which will use laser pulses to map Earth’s forest densities from the International Space Station. He used it for a similar purpose on the Advanced Topographic Laser Altimeter System aboard the Ice, Cloud, and Land Elevation Satellite-2, which is measuring the polar ice sheets, as well as other topographical characteristics. TracePro has also helped NASA design cameras for the Mars rovers Spirit and Opportunity, the Long Range Reconnaissance Imager aboard the New Horizons probe, and the Galaxy Evolution Explorer space telescope, among others. Lambda now has 15 employees, thousands of TracePro customers, and about six times the revenue it had when TracePro was first released. Much of this success has been the result of taking what was originally a stray-light analysis program and repurposing it for an ever-growing number of industries. “It’s amazing what these tools can do, and the capability just seems to keep growing as computer technology grows,” Skelton says.